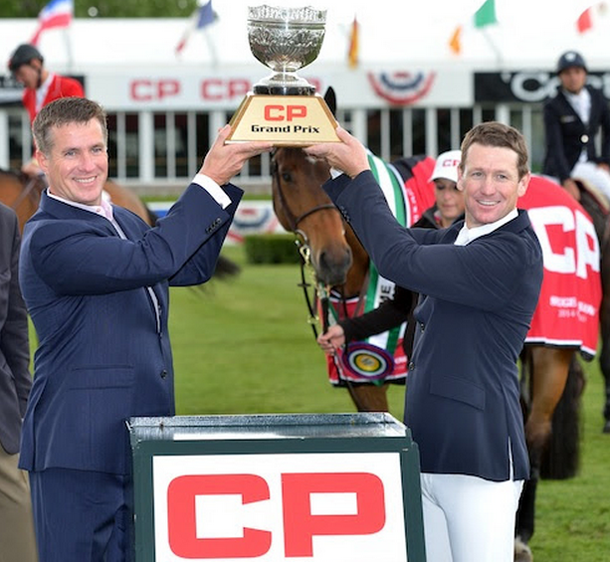 Calgary, AB, Canada – June 15, 2014 – On the final day of the 'Continental' Tournament CSIO 5* at the Spruce Meadows Summer Series, the $210,000 CP Grand Prix drew a large crowd to watch top sport. They were treated to an exciting jump-off with McLain Ward (USA) taking the top spot on the leaderboard with Rothchild over Yann Candele (CAN) riding Showgirl and Eric Lamaze (CAN) on Powerplay. Today's competition wrapped up the second of five weeks in the Spruce Meadows Summer Series, which continues with the 'Canada One' CSI 4* Tournament on June 26-29, featuring the $125,000 Imperial Challenge 1.55m on Sunday, June 29. There were 35 entries in the $210,000 CP Grand Prix, and five of those moved on to contest the jump-off for speed. The course, a challenging one set by Anthony D'Ambrosio of the United States, had 14 numbered obstacles including a difficult line with the open water to an oxer, followed by a triple combination. D'Ambrosio noted, "I thought it was a good results, a good challenge. There were several different ways to solve the problems out there. I put more emphasis on rideability and a little bit less on sheer scope. It was a good day of show jumping." Lamaze added, "I think it was a very technical course. It just came very quick at you. It was well-built. The horses just needed to pay attention today. That was the difference for people who had success, their horses were very attentive." First to go in the jump-off was Canada's Yann Candele and Showgirl, owned by Watermark Group. They set down a quick, clear round in 45.77 seconds, which would finish in second place. "I know all of them, I knew they would be faster than me," Candele stated. "The key was for me to stay clear. McLain tried to create some pressure and create some mistakes. He created the mistake for everybody else, that's why I got second. Everybody was faster than me today. With the big gallop, it's a little bit of an illusion. People think we're sometimes faster than we are. My turns were a little slow, and that's where I lose a lot of time. We don't know each other that long." Ward and Rothchild, owned by Sagamore Farm, were next in. They sped around the shortened course, completing a great inside turn from an oxer to the "CP planks" and stopped the timers in 43.29 seconds to go into the lead. Ward recounted, "I was lucky. Going first in the jump-off like that is tough, for Yann. I thought he took a pretty good route. His horse looked like it was slowing just a little bit as he was trying to press her on. Rothchild is a hot little horse. I felt if I could do the same track, it would be quicker and put the pressure on the ones behind me. I certainly think that I left enough room that if someone put in a hell of a round to beat it, it wasn't unbeatable. You put a little pressure, and people are trying very hard. A little mistake here and there, and once in a while things go your way." It was that CP planks jump that would play a big part in the last three competitors' rides. Lamaze and Powerplay, owned by Artisan Farms LLC, took down three of the top planks after their inside turn didn't go as planned. Their time of 43.29 seconds slotted them into third place. Lamaze said of his rail down, "I was fast one to two. I carried the speed into the next oxer, and then I felt I needed that turn. It's sort of what came up, distance-wise. I was committed to the turn, and there was a distance in front of me. I just rolled back on it and at the end, I was underneath the plank, and I was too short. But that's the risk you've got to take in the jump-off." Christine McCrea (USA) and Romantovich Take One, owned by Candy Tribble, completed the turn but just tapped the top plank for four faults for fourth place in 43.87 seconds. Tiffany Foster (CAN) and Artisan Farms LLC's Verdi III had four faults at the jump before the planks and had a slip through the turn, pulling up before the plank jump. They attempted three more fences before retiring on course for fifth place. Lamaze said that he was very happy with Powerplay, a 10-year-old Holsteiner gelding by Casall x Limbus. The pair has only been together for a year, and Lamaze feels that Powerplay is now learning how to go with speed. He agreed, "I'm very happy with my horse. I never even thought a year ago that I could take a shot at McLain's round with that particular horse. But he has learned to be much faster so that I could try and compete. Unfortunately today we had one down. If I can think of the biggest progress that horse has made, he's learned to carry a little speed and jump the fences, which a year ago he wasn't able to." It is also a newer relationship for Candele and Showgirl, a 14-year-old Selle Francais mare by Gold de Becourt x Elf III. Showgirl was purchased for Candele with the goal of qualifying for the Canadian team for the Alltech FEI World Equestrian Games in August. With that in mind, Candele's main goal this week was a strong performance in Friday's Nations Cup. But Candele does feel that Showgirl has improved, and their relationship has become stronger since the beginning of the year. "We consider that it takes six months to a year to know the horses that we are riding. There's a lot of things, like bridle, tack, know the personality. I made some major mistakes in Florida at the beginning, but through the season there was progress," he acknowledged. "These mistakes are disappearing because we understand more who she is. I understand more who she is. We know which way we need to go. It just takes time." Ward has seen Rothchild, a 13-year-old SBS gelding by Artos Z x Elegant de L'le, step up to become a top 1.60m horse in their five years together, and it took understanding what Rothchild was willing to give. "He's a little special. You've got to be his friend. Through the years, he's really become my friend," Ward said. "I believe in this horse. You have to give in a little bit to his personality traits, but he tries for you. I think we would all agree that we would much rather (have) a horse that does it their own way, but gives you what he has, than something that is super talented and always finds a way to knock a jump down. He has a lot of heart, this horse." When Ward needed Rothchild to step up as his top horse, the determined pair made it happen. In addition to today's grand prix, they won the Antwerp Grand Prix in April. "He's gotten better and better at it, and probably I've gotten to believe in him more and more. The result is a more consistent performance at this level. This year in Florida, he performed beautifully and I made a few mistakes in jump-offs trying to win too hard. This summer I tried to just take a step back and ride his round, and the result is that he's now won two big grand prix," he remarked. Following the 'Canada One' Tournament (June 26-29) is the 'North American' CSI 5* Tournament on July 2-6, featuring the $210,000 ATCO Power Queen Elizabeth II Cup on Saturday, July 5. The $210,000 Cenovus Energy Classic 1.50m Derby will be the highlight on Sunday, July 6. There will also be the $85,000 Sun Life Financial 'Reach for the Sun' 1.55m competition on Wednesday, July 2, and the $85,000 Progress Energy Cup 1.55m on Thursday, July 3, as well as the $85,000 TD Cup 1.50m on Saturday, July 5, and the $85,000 Enbridge Cup 1.50m on Sunday, July 6. Concluding the summer tournaments, the 'Pan American' CSI 5* Tournament will run July 10-13, featuring the $400,000 Pan American Cup presented by Rolex on Sunday, July 13. > Photo Caption: Spruce Meadows Photo © Spruce Meadows Media Services.